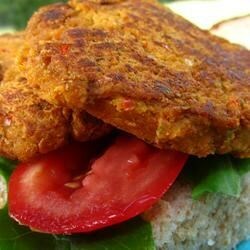 "These tasty garbanzo bean burgers are quick, healthy, and cheap. Served with either a nice green salad, or a bun with salsa or mayo, they make a nice main meal or party snack. Plus my little one will eat them so that's always good! They're oven baked too, not fried in fat (even though you could!)." Make the patties normal size for dinner portion hamburgers, fun shapes for kids, or mini burgers for parties. nice flavour but they aren't really burgers, I tried adding some binding to the second batch, and still they were mush. But nice flavour. Very Delicious! I make these as a man dish with a veggie and some ketchup, Fantastic! They were really good! Maybe a couple of ingredients missing can’t seem to put my finger on it though!